You know what they say…Midwest is best, and so are our wedding venues! There are blow-your-face gorgeous venues all across the country, but Indiana’s have that special midwest glowww. From industrial buildings in the middle of the city to acres of hills and trees in Brown County, Indiana has a little something for everyone. These wedding venues will take your breathe away! If you’re in love with that moody, industrial looks, INDUSTRY is the space for you! Complete with huge windows, all glass garage doors, and beautiful cement floors, this space lies in the heart of Downtown Indy giving you the ultimate city feel. You can even open the garage doors and have food trucks for your guests! They even provide wooden farmhouse table and industrial metal chairs with your rental! Overall, INDUSTRY is the dreamiest blank canvas for all those ideas you’re dreaming up. Did I mentioned that your dogs are allowed too?! Another industrial beauty right in downtown Indy! Found on the second floor of a century old building, it beautifully mixes an urban and modern feel. Complete with skyline views, alll the industrial charm you could ever want, the prettiest getting ready rooms in all of Indy, AND you now have the option to rent out Provider on the first floor of Tinker House. Aka you get the trendiest new spot in Indy for your cocktail hour or second bar or use it for the perfect minimal aesthetic backdrop for your couple portraits. And yep, there’s lots of plants and a neon sign involved! 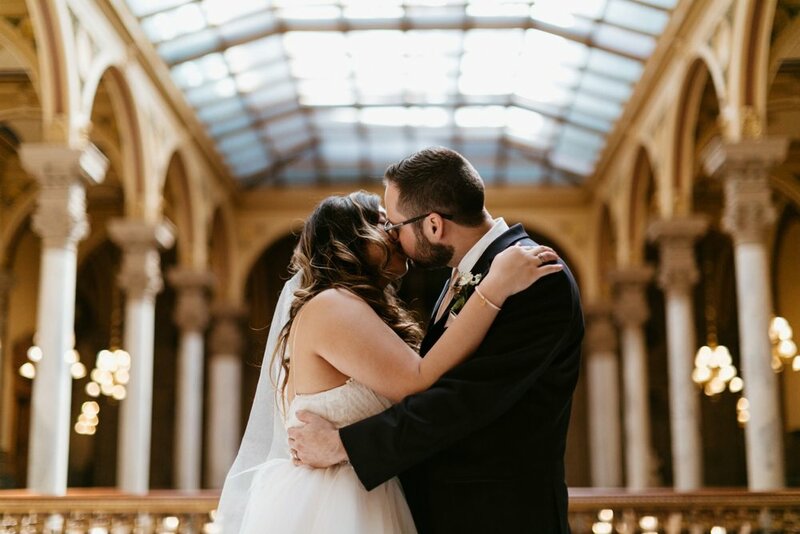 You will fall in loveee with the Indiana State House! This space loves to show off. I mean look at it! All the grand, majestic vibes you’ve dreamed of. And it’s in the middle of downtown Indy, so it’s close to all the restaurants and museums for your out-of-town guests to enjoy. If you fall in love with the state house, remember it’s only available for your ceremony, so you’ll have to have your reception at a separate venue. Uhhh, the dreamiest of dreamy spaces!! This place is honestly blow-your-mind beautiful. Think of it as your own little slice of a European mansion in middle of Indiana. It has that old world charm and the most beautiful vintage touch. The light bounces off the multiple floors of wooden staircases while the solarium is the most magical room (all windows, indoor greenery, and the most swoon-worthy tile accents) for a small weddings. Seriously, there are so many options at Laurel Hall, outdoors and indoors! This might just be my favorite place in all of Indy. Do you dream of a rooftop wedding venue as much as I do because just look! Ah! 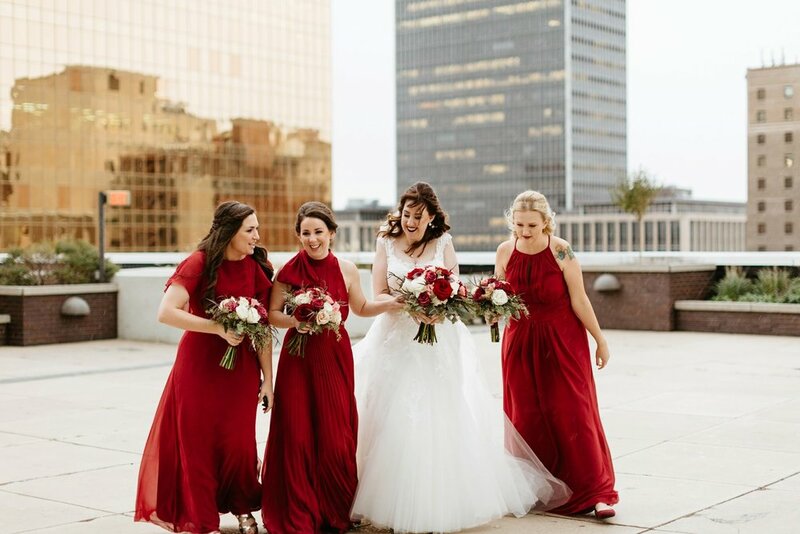 JPS Events at Regions Tower is the only rooftop wedding venue in Indianapolis, so this is definitely worth a tour. They have the outdoor rooftop space and and indoor reception space, with getting ready rooms available as well. Plus there are string lights hung around the rooftop and fire pits to make for the coziest and most epic reception! One of the absolute dreamiestttt wedding venues in Indiana if you’re planning an outdoor ceremony. The ceremony spot under a wooden arch is perfectly poised for a sunset wedding. You’re completely surrounded with greenery and nature, giving off the most serene vibe. It’s nestled among the trees in Zionsville, and the white walls and bright indoor space gives you a perfect backdrop to create any vibe you’re imagining! And if the weather is nice enough, you can have your first dance outside, under the stars and twinkling Edison bulbs. More greenhouse weddings, please! The Garfield Park Conservatory is perfect for small, intimate weddings and elopements. Just imagine saying “I do” in front of a waterfall and surrounded by lush, green plants. 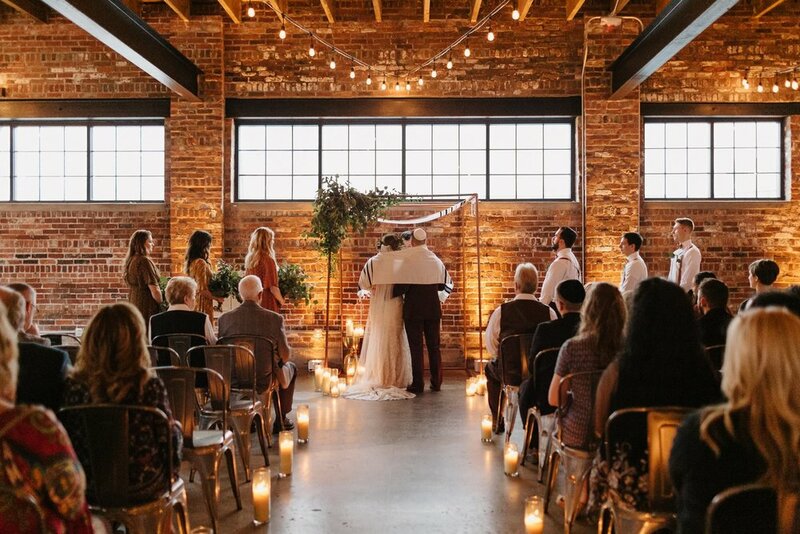 In an all glass building, this venue has beautiful lighting rain or shine! Walk along the Sunken Gardens right outside of the conservatory for an extra backdrop for portraits. And you’re only 5 minutes to the heart of downtown indy! The IMA is an Indianapolis classic! Not only is it the perfect place to browse art, but the grounds and gardens make the perfect spot for a wedding. You’ll have endless backgrounds for portraits, including the Lilly House (get some of those classy, editorial feels), the greenhouse on site, and the 100 acres close by! Both indoor and outdoor options are available to choose for your wedding day! The IMA would make a perfect spot for a garden-inspired wedding or a contemporary, unique art space for those who want something a little different. This brand new venue in Bloomington, Indiana perfectly combines a farmhouse feel with a bright, modern touch. The all white indoor interior leaves the space open for endless possibilities, from all things color or a modern, minimalist vibe! Anddd, The Wilds sits on acres and acres of Brown County’s most beautiful hills! Yep, seriously could not get any better.